YA love stories are the best love stories. 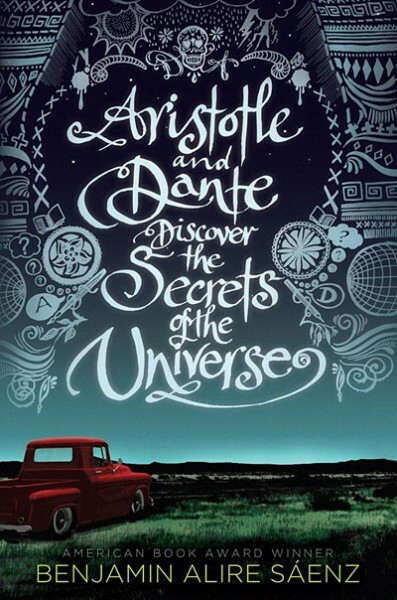 When I decided I was going to post about Aristotle and Dante Discover the Secrets of the Universe, I went and grabbed my copy so I could thumb through it while writing, the way I usually do when I’m composing a post. But then, instead of just flipping through idly, I accidentally ended up rereading at least a third of the book. So now it’s a lot later than I’d like it to be and I’ve made very little headway on this post, but I couldn’t help it—Aristotle and Dante is just that good. Aristotle (Ari, for short) and Dante are two Mexican-American teenage boys who meet and fall in love the summer they’re fifteen. Dante is aware of this happening. Ari is not. Ari has walled himself into and away from himself. He doesn’t let himself catch on, so, for a long time, they’re friends. They hang out, they invent ridiculous games, they smoke weed, they fight, they make up. They have conversations in dialogue that’s so real it aches. A lot of really intense stuff goes down that I won’t spoil for you, but through it all, they keep coming back to each other. And eventually, with a lot of help, Ari starts to dismantle his walls. Benjamin Alire Sáenz is a poet, and in some ways, Aristotle and Dante reads like poetry to me, the kind of yearning, careful, guarded poetry that might pour straight from the soul of a mixed-up, kindhearted teenager like Aristotle Mendoza. The rhythms of Ari’s voice are just infectious—for a while after you finish this book, you’ll find yourself thinking in teenage boy poetry, too. Trust me, it’s a lot more fun than it sounds. This entry was posted in June 2015 and tagged aristotle and dante, aristotle and dante discover the secrets of the universe, benjamin alire saenz, June 2015, lgbtq, love stories, romance, ya. Bookmark the permalink.